This Eagle Glen home for sale has tons of upgrades, a fabulous floor plan, and massive, private backyard. It is located at 10512 Eagles View Drive, in the Northshore area of West Knoxville. This Eagle Glen home for sale has been kept in great condition, making it a must see in the West Knoxville area. It has a list price of $329,900. 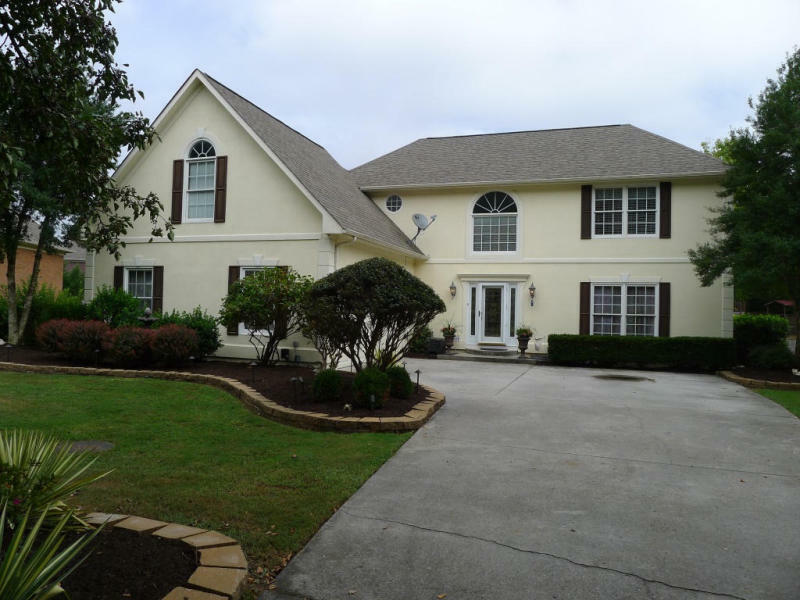 on the main level, this Eagle Glen home for sale has an open two story foyer. The main level has a spacious living room and dinning room. There is also a spacious office area on the main level, with a large built in desk and cabinets. The kitchen has also been recently renovated and comes complete with stainless steel appliances, tile back splash, updated tile floors, and tons of cabinet and counter space. There is also a spacious eat-in area. The kitchen opens up into the family room and has tons of natural light and a gas fire place. The second floor of this West Knoxville home for sale has 4 spacious bedrooms, including the master suite. The master suite of this Eagle Glen home for sale spacious and has tons of natural light. The master bath has been recently upgraded with a new dual sinks, a large tub, and walk-in shower with a rainfall shower head. There is also a large attached walk-in closet. The remaining 3 bedrooms are spacious as well, with one large enough to double as a bonus room, if necessary. In addition, this Eagle Glen home for sale has a massive, fenced in backyard, with a large deck. Does this Eagle Glen home for sale have what you’re looking for? If so, please let us know if there is anyway that Knoxville Home Team can assist you, we’d be more than happy to arrange a private showing of this Eagle Glen home for sale today. Rick can be reached at 865-696-9002 or via email at Rick@KnoxvilleHomeTeam.Com. Kati can be reached at Kati@KnoxvilleHomeTeam.Com or by phone at 865-696-1888.